Apart from giving movement to your upper body, allowing you to move around, bend at the waist, run, jump and just be mobile in our environment, the spinal column also houses the spinal cord – responsible for sending messages from the brain to your nerves on each side of the spine, controlling everything in the body. If anything happens to your spine, these messages will not get to your nervous system and can cause you to become immobile or limit the function of certain parts of your body. There are many different things that can happen to your spine, like lumbar diseases, breaks and misalignment of the over 30 vertebrae making up the spinal column. In some cases, or indeed, most cases surgery is needed to rectify the problem. 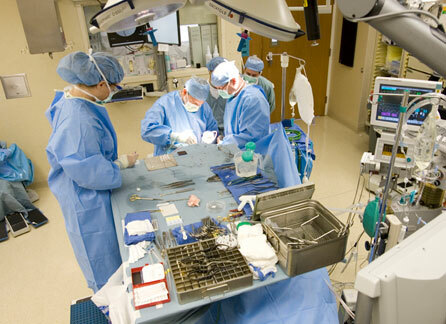 Neurosurgery disc surgery is one of these surgeries. What is Neurosurgery Disc Surgery? In the case of a bulging vertebral disc problem, your doctors might recommend you look into neurosurgery disc surgery. Each of your vertebral discs is made up of a strong out covering called the annulus and a soft jelly-like centre called the nucleus. In cases of bulging discs, the annulus becomes damaged, and stretches or tears causing the disc to bulge. Because of the high number of nerves located behind each of your vertebral discs, a bulging disc can often apply pressure to a nerve which can mean a lot of pain or even disability. Patients suffering from bulging discs often complain about a huge amount of pain and discomfort caused by the pinching of these nerves. The pain is not always localised to the back as, for example, a bulging disc in the lower back would cause pain and weakness in the legs and knees. There are two common types of surgery that we would find in cases like this – fusion therapy or disc resection. Neither surgery is very effective and is full of complications and side effects. With fusion therapy, the two vertebrae above and below the bulging disc are fused together to stop the disc from bulging. With this method, however, the vertebrae near the fused ones will end up having to work more to compensate for the fused vertebrae, ending up in the condition spreading through the spine. With disc resection, the bulging part of the disc is removed. In this case, the problem often reoccurs within 5 years. Neurosurgery disc surgery is a risky operation and often used as a very last resort to sufferers of this condition. Because of the variations of this surgery, it is impossible to give out an estimated cost of this kind of surgery, but it should be important to know that the NHS often does not authorise it, although it is on their list of allowed surgeries. When it comes to the options for neurosurgery disc surgery, it’s important to remember, the success rate is very low and as such you should always view it as a last resort.